This UNC Advisory Committee has a total of 31-people mostly from the academic side. Your own Ken Peacock is a member. There are approx. 6-7 members from the business side. 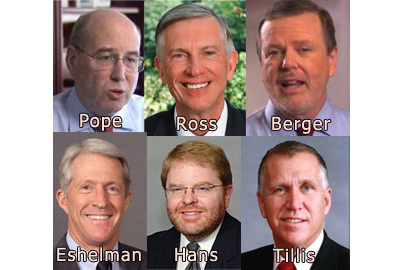 Tillis and Berger are there to represent the majority in the NC Legistature, Janet Crowell is the NC Treasurer, Bill Friday,Harold Martin,Linda Frady,Holden Thorp,Steve Ballard,etc and you pick out six members that you don't like out of the 31. Have you no shame? And then you use the left wing, Chris Fitzsimon to get the news. Get out of your cocoon up there post something that does not reflect your silly views.I bet Ken Peacock doesn't agree with any of your "blogs". That puts the number of business/private enterprise representatives at about 15. Number of students representatives? 1. Number of faculty representatives? 1.